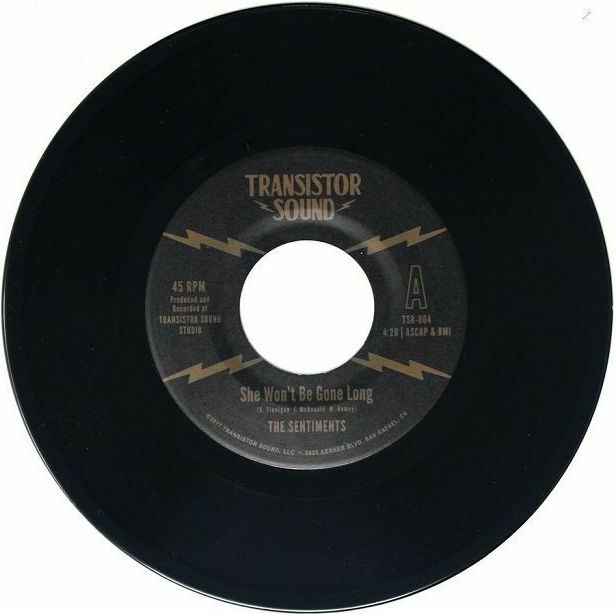 Featured Track: "She won’t be gone long"
Sweet California Soul with remnants of Philly and Chicago Doo-Wop make this new 45 from Transistor Sound a must have for fans of the slow and low sound. The Sentiments have composed in one song a companion for warm summer nights and long winter days. Let the sweet, soulful sounds of “She Won’t Be Gone Long” wash over you. Lush strings and horns compliment a brilliant falsetto lead that pull on the heartstrings. This 45 encompasses everything you want a lowrider slow jam so don’t sleep on it. Produced and Recorded entirely at the incomparable Transistor Sound Studio, featuring members of Monophonics, Gene Washington & The Ironsides, Paul & The Tall Trees, His Extraordinaire’s Horns and The Sha La Das.